Ubiquinol is the reduced form of coenzyme Q10, also known as CoQ10, ubiquinone or simply Q10. Coenzyme Q10 is recognised as a powerful antioxidant and is used in the formulation of many anti-ageing creams. Extensively studied, it has also demonstrated protective benefits for certain of the body’s vital organs, and for the prevention of some diseases. As a consequence, CoQ10 is also available as a dietary supplement from the Supersmart catalogue. While coenzyme Q10 may be more widely-known than ubiquinol, the latter also offers important benefits for protecting the body and thus delaying the ageing process. Scientific studies suggest too that ubiquinol may be more absorbable, stable and resistant to oxidation than coenzyme Q10. by boosting the effects of nutrients including vitamin C, the tocotrienols and carotenoids such as astaxanthin. 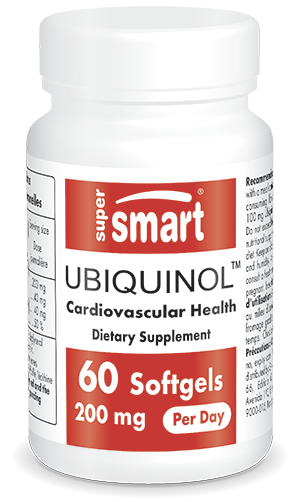 In a general sense, ubiquinol appears to have a positive effect on how the body and its cells function. Given its protective effects, scientists have investigated ubiquinol’s therapeutic potential. While studies are still ongoing, ubiquinol has been identified as helping to delay the ageing process and thus prevent the development of associated diseases such as age-related macular degeneration (AMD). Its neuroprotective effects in the brain may also help prevent or combat neurodegenerative diseases such as Huntington’s and Parkinson’s disease. Similarly, ubiquinol’s heart-protective effects may offer benefits for the prevention and treatment of hypertension. Finally, research has indicated a positive effect for this nutrient against migraines. Further studies are underway to expand our understanding of ubiquinol’s therapeutic properties. Based on this scientific research, our product provides an optimal intake of ubiquinol, in the form of 100mg vegetarian capsules, with a suggested dose of one to two capsules a day. To boost its protective effects, ubiquinol can be combined with other powerful antioxidants such as butylhydroxytoluene (BHT) . You can also capitalise on the benefits of glutathione, one of the body’s key antioxidants. There are enzymes too with antioxidant properties such as superoxide dismutase (SOD), available in a stable form in the patented supplement GliSODin®. Other ingredients : Medium chain triglycerides, beeswax, soy lecithin.